05-Jan-2016 -- After Christmas we decided to go for a few days to England, visiting London and some nice old-fashioned Hotels nearby. On our way from Luton, North of London, where we stayed at the beautiful old Luton Hoo Hotel (a location with a history of almost 1000 years) towards the south coast, we passed this confluence. Very British weather conditions welcomed us at the fence gate where we stopped the car to walk the remaining 450 m to the confluence: It was raining heavily and was almost getting dark although it was only 3 p.m. Anyway, after two hours driving on the "wrong side" of the road (which still drives me crazy...) it was about time for a break and a walk. So I followed the muddy path and quickly found the confluence and had a very stable signal there to get the zeros. 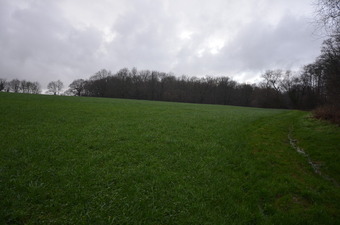 I stood with one leg on the eastern and with the other leg on the western half of the world...a good feeling... if it wasn´t on a muddy field in the rain somewhere in southern England... as there wasn´t much to see, I took my photos and returned to the car, with confluence visit no. 44 in my pocket. We continued our drive towards Eastbourne to stay in the the beautiful Grand Hotel at the coast.